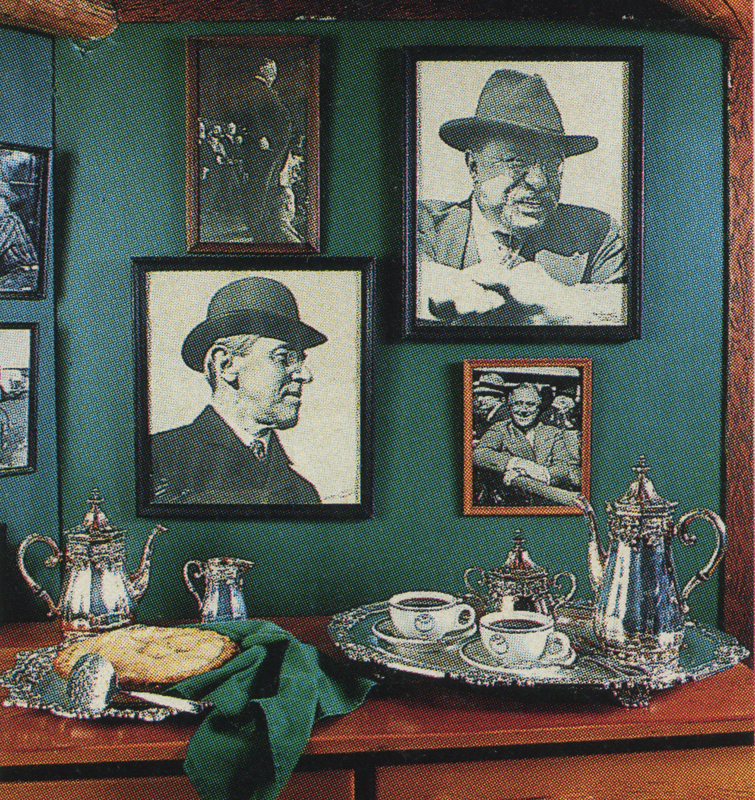 The Baldpate Inn’s beginnings originate with a newly married couple, Gordon and Ethel Mace and Gordon’s two brothers, Charles and Stuart Mace. 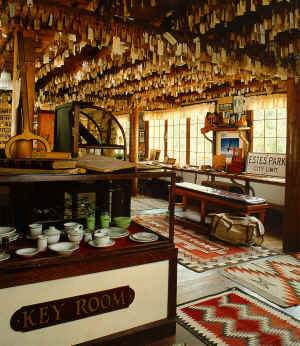 In 1911, while visiting Estes Park on their honeymoon, the Maces were so taken with the area’s beauty that they decided to homestead the property upon which the Baldpate now stands. Initially only a small Homestead cabin was built on the land and rhubarb was planted to fulfill the requirements of the Homestead Act. In order to supplement their income, the Mace family built several small tourist cabins which proved to be a huge success. To accommodate the overwhelming demand for their hospitality, the family made plans to build an inn. 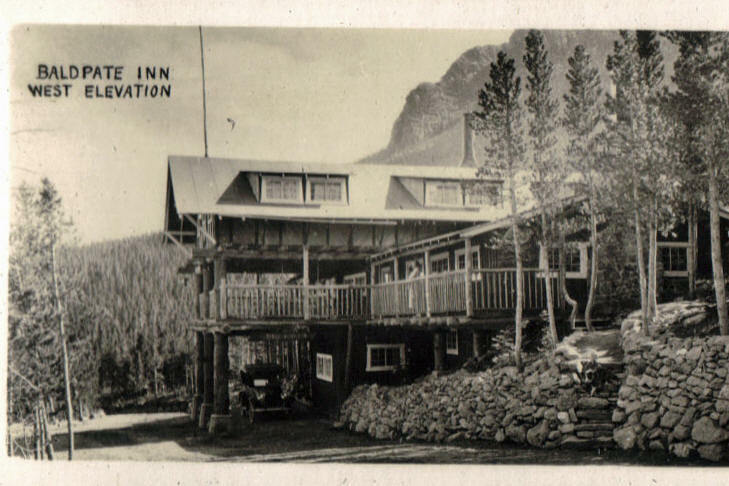 With their homestead patent registered as complete on January 22, 1917, the family officially opened The Baldpate Inn as we know it, that same year. 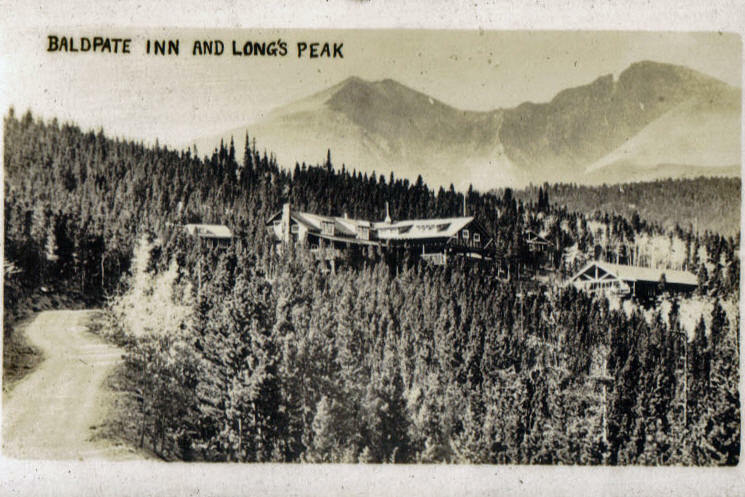 With financial resources being very limited, the Mace family used their talents with what natural resources were available and constructed the inn from hand-hewn timber cut from the property. Massive stone fireplaces were built to provide warmth and hot water. The Baldpate was opened boasting such amenities as hot running water, electric lights, and indoor plumbing! The Inn was named after the mystery novel, SEVEN KEYS TO BALDPATE by Earl Derr Biggers, who upon visiting the property stated that the inn was so similar to the heretofore “imaginary” Baldpate Inn, that the Mace’s hotel would become the “real” Baldpate Inn. In the novel, each of seven visitors traveled to the closed-in-wintertime hotel, and thinks that he or she has the only key to the Inn. In keeping with the story line of the novel, the Mace family gave each visitor to the Inn their very own key. This tradition continued until the outbreak of World War I, when the price of metal became so expensive that the Owners were no longer able to give keys away. The loyal guests who returned yearly were so disappointed that they began their own tradition of bringing a key back to the inn with them each year. It is said that the competition between guests became so fierce to bring the best and most exotic each year that the Maces decided to begin a display of all the keys. 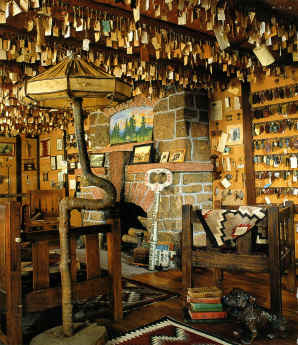 This was the beginning of the world’s largest key collection (as shown in the two pictures above). The collection boasts over 20,000 keys including examples from the Pentagon, Westminster Abby, Mozart’s wine cellar, and even Frankenstein’s castle to name a few. Currently we are working with American History Savers to preserve and catalogue our collections. 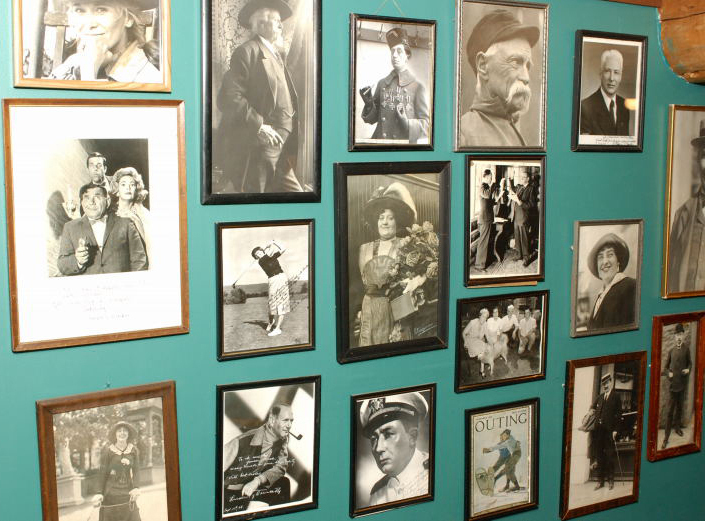 The Dining room of the Baldpate Inn has often been known as the “Hall of Fame” not merely because of our outstanding restaurant and staff, but because of the photographs displayed there. The Baldpate Inn Photograph Collection registers a long list of autographed pictures of U.S. presidents (Teddy Roosevelt, Franklin D. Roosevelt, Woodrow Wilson, George Bush), movie celebrities, (Lana Turner, Jean Harlow, Roy Rogers), captains of industry (Henry Ford, Randolph Hearst), folk heroes (Wild Bill Cody, Weston the Walker), and world renowned figures (Thomas Edison, Tetrazinni, Jack London). These photographs are primarily the creative work of two of the Mace brothers Charles (one of the Inn’s original owners) and Stuart Mace, both professional photographers. In 1911 Charles Mace was awarded first prize in an Eastman Kodak national photo contest. While in the Army during WWI, Charles was honored to be chosen as General John J. Pershing’s personal photographer. 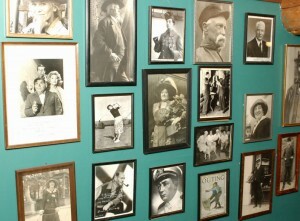 Charles returned after the war to co-manage the Inn and resume his work as a photojournalist for the Denver newspapers. His work received such acclaim that he was welcomed into the elite Denver Press Club as its youngest ever member. During the 1920s Charles sold many photographs which featured his wife, Gloria, and Gordon’s wife, Ethel, to Kodak and Colgate for use in advertising. Several of these advertisements are displayed in the collections at Baldpate. Brother Stuart Mace and his family settled in the area of Aspen,Colorado where they created the retreat at Tolklat. In the early 1920s, after covering the Pueblo floods as a photojournalist, Stuart died rather suddenly of pneumonia. Only the second family to own and operate The Baldpate Inn, the Smith family purchased the Inn in 1986. For the past 30+ years we are pleased to have continued sharing this enchanted place with visitors from around the world and to have achieved Baldpate’s recognition as listed on the National Register of Historic Places. Through the years we have carefully renovated many of Baldpate’s buildings to include the original Homestead and will continue to work to preserve and document its one of a kind collections. During the September 2013 Flood disaster, our building stood strong although our road and some of our infrastructures received damages. We are in the process of repair and restoration with greatly appreciated donations and an emergency grant from Colorado Preservation Inc & History Colorado. We welcome world wide travelers to experience the very special enchantment of The Baldpate Inn and its one of a kind collections! For even more fascinating history and stories about our inn please enjoy our 100 days birthday blog created to celebrate our 100th birthday in 2017.